An unstoppable energy weapon leaves Atlantis under seige after Earth launches a preemptive attack against the Replicator home world. A new ship has arrived in Atlantis from Earth: the Apollo, commanded by the brusque and take-charge military officer, Colonel Abe Ellis. 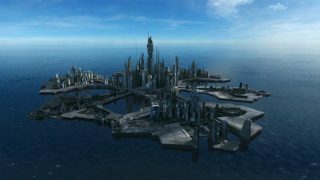 Ever since the human-form Replicators (the Asurans) tried to seize Atlantis (“The Return, Part 2”), the Daedalus has been doing reconnaissance fly-bys over their homeworld. And they’ve found something. Colonel Ellis reports to Dr. Elizabeth Weir, Lt. Colonel John Sheppard, and Dr. Rodney McKay that the Replicators are building a fleet of ships. 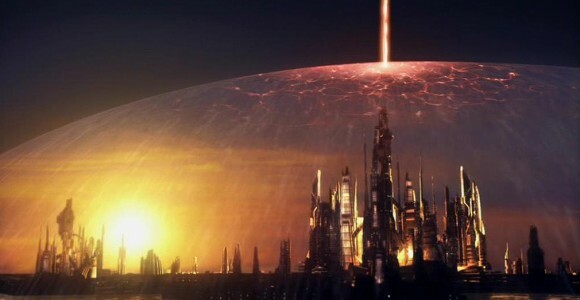 Presumably, the technologically advanced strike force is coming to Atlantis, to reconquer the city that the artificial lifeforms were forced by their creators, the Ancients, to leave thousands of years ago (“Progeny”). But, Ellis boasts, they aren’t going to get that far: He has been sent to command a strategic first strike against them. Because these Replicators appear to build their ships out of standard materials rather than forming them out of Replicator cells (as did the Replicators in our home galaxy [“New Order”]), they can be destroyed the old fashioned way. Meanwhile, McKay reports, the Asgard have created a satellite weapons system that can wipe out an entire planet populated with Replicators. Area 51 is trying to do the same thing. But Weir is gravely concerned about the mission. Even if it is a great success, they will be starting a war — a war against a very powerful enemy. And she will have to take drastic measures in order to save the city of Atlantis. “I don’t want to give anything away, but what I think is the most brilliant thing we’ve done on Atlantis during the past three years will happen at the end of this episode. Basically, it will be like a ‘soft’ reset on a ton of issues. “It’s so tough to talk about it without going into specifics, but essentially it opens up so may other avenues in terms of storytelling. The writers have found a clever way to take Atlantis down an entirely new creative path as well as bring a fresh tone to the programme, while at the same time keeping true to the classic elements already established. VOTE! How would you rate Atlantis's "First Strike?"